Welcome back to the newest installment of the Safe Withdrawal Rate Series. To go back and start from the beginning, please check out Part 1 of the series with links to all the other parts as well. Today’s post is a follow-up on some of the items we discussed in the ChooseFI podcast a few weeks ago. How do we react to a drop in the portfolio value early on during our retirement? Recall, it’s easy not to worry too much about market volatility when you are still saving for retirement. As I pointed out in the Sequence of Return Risk posts (SWR series Part 14 and Part 15), savers can benefit from a market drop early during the accumulation phase if the market bounces back eventually. Thanks to the Dollar Cost Averaging effect, you buy the most shares when prices are down and then reap the gains during the next bull market. That has helped the ERN family portfolio tremendously in the accumulation phase in 2001 and 2008/9. But retirees should be more nervous about a market downturn. Remember, when it comes to Sequence of Return Risk, there is a zero-sum game between the saver and the retiree! A market drop early on helps the saver and thus has to hurt the retiree. What should the retiree do, then? The standard advice to early retirees (or any retiree for that matter) is to “be flexible!” Great advice! But flexible how? We are all flexible around here. I have yet to meet a single person who claims to be completely inflexible! “Being flexible” without specifics is utterly useless advice. It’s a qualitative answer to an inherently quantitative problem. If the portfolio is down by, say, 30% since the start of our retirement, then what? Cut the withdrawal by 30%? Keep withdrawals the same? Or something in between? How flexible do I have to be to limit the risk of running out of money? As we mentioned in the ChooseFI podcast and elsewhere: Nobody will ever set a fixed withdrawal amount and then just watch the portfolio dwindle away after years of poor returns. One way to prevent premature depletion is to set the withdrawals to one constant percentage of the portfolio every year (or month). The unpleasant side effect of this so-called Constant Percentage Rule: Withdrawals become just about as volatile as the portfolio. Let’s look at the hypothetical numerical example below (actual data will follow soon, be patient, everybody!). We start with a million dollar portfolio and an initial withdrawal of $40,000. We get returns of -30%,-10%,+20%,+20%, and +20% over the next 5 years, so the stock index actually recovers again (cumulative compound return of +9% after 5 years). With a fixed withdrawal amount ($40k every year) we end up with only slightly more than $800,000. In contrast, withdrawing 4% of the portfolio value at the beginning of the year we are able to mitigate that sequence of return risk at least somewhat. We finish at $887k. But it’s at the cost of much lower withdrawals along the way. In fact, the withdrawals drop by slightly more than the market: -32.8% in the second year (from $40,000 to $26,880). That’s because the second year withdrawal is reduced by both the first year market drop and the previous year’s withdrawal. Bummer! And after a 10% market drop in year 2, the year 3 withdrawal falls by, you guessed it, slightly more than the market performance the previous year: -13.6%. Numerical Example: Readjusting the withdrawals to 4% every year depletes the portfolio less but also means significant reductions in the withdrawals. So, as we said in one of the Sequence of Return post (Part 15): dynamic withdrawals don’t really avoid sequence risk. True, you mitigate the impact of sequence risk on the final portfolio value, but it’s at the cost of lower withdrawals along the way. There is no free lunch and there’s no way to completely avoid sequence risk! For how long do we have to be flexible? So, we might endure a significant drop in withdrawals. Fine! Most people can deal with that, at least for a few years. Cut expenses, maybe get a side gig, move to a country with lower living expenses and/or defer some expenses such as replacing durable items. Surely, we can all be that flexible for a year or two, or maybe even five. But can we be flexible for 28 years? The 1929 cohort that suffered through the Great Depression needed 26 years to recover the initial real purchasing power. With a 60% drop in between! The 1966 cohort needed 28 years to recover from the perfect storm of lackluster returns in the late 60s, then four recessions (1970, 1973-75, 1980, 1982-82) with poor equity returns, especially in 1974 and 1982. For 11 years in a row, withdrawals were 40% or more below the initial! The year 2000 cohort is still under water after 17 years despite the strong bull market over the past 8 years! That initial $40,000 withdrawal out of a million dollar portfolio dropped to about $20k at the bottom of the Global Financial Crisis and it’s now at just under $34,000! The 2007 cohort actually recovered after “only” 7 years. So, there’s some good news! It appears that one single bear market is something we can handle with a constant percentage rule. Two bear markets in one decade? Not so much, that’s why the year 2000 cohort still hasn’t recovered! Rolling 12-month withdrawals per $100 of initial capital under the 4% constant percentage rule (80% stocks, 20% bonds). This dynamic withdrawal rule avoids running out of money but could generate deep and extended multi-decade drawdowns in withdrawals! Notice that the 2000 retirement cohort still hasn’t recovered its initial withdrawal amount after over 17 years! But don’t get me wrong! The 4% constant percentage rule did eventually return to its original portfolio value for the 1929, 1966 and 2007 cohorts (and thus the original withdrawal amount) and it will likely recover even for the year 2000 cohort, which is much better than the stubborn, fixed withdrawal amount (CPI-adjusted). Both the 1929 and 1966 cohorts would have depleted the portfolio within 30 years if they used the traditional 4% rule, i.e., 4% initial withdrawal followed by CPI-adjustments irrespective of portfolio performance. Is there a “better” dynamic withdrawal rule? Personally, I find the volatility of withdrawals and the depth and the duration of withdrawal drawdowns quite troubling. Again, I prefer to tighten the belt by 50% for a while or even a whole decade over ending up completely penniless. But there has to be a better way to deal with sequence of return risk, right? Under the constant percentage rule, the withdrawals will move in sync with the portfolio value. In contrast, tying the withdrawals to economic fundamentals has the potential to soften the fall in withdrawals in case of a bear market! Why would the CAPE fall? The CAPE is the equity price index divided by a 10-year average earnings measure. 10-year rolling average earnings are moving very, very slowly, see the chart below; I plot the S&P500 price index (in 2017 dollars) and the 10-year rolling average earnings (also in 2017 dollars) that Prof. Shiller uses in his CAPE calculation. Notice something? The earnings line is much smoother, specifically, it hardly ever decreases even during recessions. That’s by construction; that’s where the name the name cyclically-adjusted comes from, remember? So when the stock market drops by x%, then, as a rule of thumb, the CAPE drops by roughly that much and thus the CAEY will increase. This will cushion the drop in withdrawals! In other words, by tying our withdrawals to earnings we’re bound to have a much smoother ride in withdrawals! S&P500 Price Index and 10-year rolling earnings, CPI adjusted and on a log-scale (to make growth rates comparable across time). Want to see how this cushioning effect works in practice? See the chart below. Whenever the portfolio has poor returns (blue line down) the CAPE-rule cushions the fall in withdrawals by raising the SWR. But it also works in the opposite direction. When the portfolio performs very well, then the SWR will move down again! 1Y portfolio return vs. the 1Y change in the CAPE-based Safe Withdrawal Rate. In response to a drop in the portfolio, the SWR increases! 80% equities, 20% bonds, SWR=1.75%+0.5*CAEY. Expanded CAPE withdrawal formula: Include nominal bond and cash yields, too! CAPE 1.00/0.5: a=1% and b=0.5. This is the traditional CAPE-based rule that’s set as the default at cFIREsim. With the current CAPE at 30, this implies a pretty measly SWR of just under 2.7%! CAPE 1.50/0.5: a=1.5% and b=0.5. Because the 1% intercept seemed a bit conservative, let’s raise the intercept by 0.5%. CAPE 1.75/0.5: a=1.75% and b=0.5. Even slightly more aggressive than Rule 2! CAPE 2.08/0.4: Let’s see what happens when we lower the CAEY multiplier to 0.4. But in exchange for that, I also increase the intercept to generate the same August 2017 withdrawal rate as rule 3. CAPE 1.42/0.6: Now, let’s increase the multiplier and lower the intercept. Again we target the same current withdrawal rate as in rules 3 and 4. “CAPE robust”: I use the Excel solver to maximize the August 2017 withdrawal rate subject to a constraint of never experiencing more than a 30% drawdown in withdrawals over in the post-1950 sample. I let the solver pick the parameters a,b,c, and d. Now I get a weight of 0.359 on the CAPE and +0.102 on the bond yield, but also a negative weight on the cash yield. Makes sense: The bond yield is something inherently nominal while we try to determine a real withdrawal rule. Taking the term-spread between 10-year bonds and cash seems more reasonable for the withdrawal rate rule. “best of 3” is a weighted average of the rules 4, 6 and 8. The weights are calibrated to again reach the same August 2017 SWR as in rules 3, 4 and 5, i.e., 3.41%. The constant percentage rule (4%), i.e., a=4% and all other parameters set to zero. In the portfolio we hold 80% stocks, 20% bonds, rebalanced monthly. The withdrawals take place at the beginning of each month using the end of the previous month’s portfolio value, CAPE and bond/cash yield values. The monthly withdrawal is 1/12 of the amount calculated. To smooth out some of the monthly fluctuations, I look at 12-month rolling withdrawal amounts. This would also make the exercise more comparable to other studies that use annual data only. The worst 20-year drawdown in the withdrawal (which can clearly be worse than the 20-year-point-to-point drop, when the consumption trough occurs, say, after 12 years). All the above stats are calculated for the entire sample and for the post-1950 period. I also display the drawdown of withdrawals peak to bottom for the 4 prominent crises: the Great Depression, the 1970s (and early 80s), the dot-com bubble and the Global Financial Crisis. These go back to some of the criteria I proposed in Part 11: how to grade dynamic withdrawal rules. Remember, dynamic rules don’t usually run out of money. So we need some other criteria to grade their performance and to compare different rules! Stats of 12-month rolling average withdrawal amounts. 1871-2017. 80% equities, 20% bonds. The constant 4% rule has consistently the worst volatility and drawdown stats. The withdrawals are roughly as volatile as the portfolio. The drawdowns from the initial withdrawal to the bottom are routinely 50% or more in some of the crises, even close to 60% in the 1970s. So, the retiree during the 1970s would have to be flexible enough to cut annual withdrawals from, say $40,000 to $16,000 per year. Of course, this rule also has the highest current withdrawal rate at 4%. That’s the tradeoff: the more generous the SWR the more flexibility will be required if there’s a bear market! The CAPE-based rules have the same portfolio return volatility (by construction: all simulations are using an 80/20 portfolio). But their withdrawal volatility is significantly smaller than the portfolio volatility and more than 50% smaller than under the constant 4% rule. All of the other risk measures also look much better than under the constant percentage rule. But then again, the current withdrawal amounts implied by the CAPE are roughly 15% smaller. But considering that I have proposed 3.25% elsewhere, I was positively surprised that some of the dynamic rules now imply a withdrawal rate of 3.41% even with a CAPE at 30! Quite intriguingly, the CAPE-rules handled the Great Depression extremely well. The CAPE was at 30+ in 1929 and then dropped to 5(!) in 1932. You would have withdrawn only 3% at the peak and over 10% p.a. at the bottom, so even after a precipitous drop, the withdrawal amount was not reduced that much. But that was OK because the market rebounded very rapidly in the mid-1930s. More challenging than any other crisis in recent history: The 1970s! As mentioned above, between 1970 and 1982 we had four recessions, two of them major. What’s worse, due to the inflation shock and rising bond yields, bonds got hammered and negated any diversifying benefit in this episode! Under the constant percentage rule, a $40,000 initial withdrawal would have been decimated to $16,000 in the early 80s. Withdrawals would have been below $25,000 for 11 straight years, see the chart for the January 1966 retirement cohort, below. Even with the CAPE-based rules, retirees had to tighten the belt by 20 to 36%. It’s better than the roughly 60% drawdown under the constant percentage rule, but the CAPE-rules also took even longer to recover than 28 years! Withdrawal amounts under different CAPE rules for the January 1966 retirement cohort. 80% equities, 20% bonds. Under the constant percentage rule, a $40,000 initial withdrawal would have been decimated to $16,000 in the early 80s. Withdrawals would have been below $25,000 for 11 straight years! Michael Kitces proposed adjusting the withdrawal rates according to the Shiller CAPE. The adjustments come in discrete steps: SWR=4.5% if CAPE>20, SWR=5.0% if CAPE between 12 and 20, SWR=5.5% if CAPE<12. I find this rule very unappealing. The jumps in the withdrawal rates are a) not big enough to effectively smooth out the withdrawal path and b) are completely discrete so most of the time there is no smoothing at all and we’re back to a simple constant percentage rule with all the unwanted volatility of withdrawals. I also find the 4.5% SWR for today’s CAPE regime quite high. It may be fine for a 65-year old retiree who is comfortable with capital depletion but certainly not for a 35-year old retiree with a potential 60-year horizon. The Bogleheads VPW (Variable Percentage Withdrawals) is a variation of the constant percentage rule. It takes into account that the investment horizon shrinks as people age, thus, the VPW methodology calculates an increasing path of SWRs to account for that. If you’re fine with depleting your capital then that’s an appropriate thing to do. Personally, I’d prefer to preserve the capital for future generations and for charitable causes. But definitely, as a safety margin, one could switch to capital depletion in case of a major drawdown. For example, if after 10 years (or certainly 20 years) of a 60-year retirement horizon we like to increase our withdrawals we could simply switch from capital preservation to (at least partial) capital depletion and easily gain a bump of 20% or more in withdrawals. That will easily bring back the CAPE-based rules back to normal. Guyton-Klinger: We wrote about this method in Part 9 and Part 10 of this series and also in the case study in Part 11. Qualitatively, this method displays some of the same problems as the constant percentage rule: steep and extended drawdowns in withdrawals. The more I look into this rule the more I dislike it. GK puts “guardrails” around the withdrawal percentages. But volatility in withdrawal percentages is not the problem. The volatility of withdrawal amounts is what bothers me! In fact, the CAPE-based rules work so well because of the dynamic withdrawal percentages and their ability to smooth out the market volatility! Flexibility is a useful tool when dealing with the prospect of a drop in the portfolio value early on in our retirement (Sequence of Return Risk). But it’s also a double-edged sword. While eliminating the risk of completely running out of money after 30 years we increase the risk of steep cuts in withdrawals along the way. If your notion of flexibility is to “maybe forego the CPI adjustments for a few years” or “cut the cable bill for the duration of market drop” then that may be enough flexibility for very small market moves. But major recessions and bear markets require drastic multi-year, even decade-long reductions in withdrawals. One hedge against this is to tie the withdrawal amounts to economic fundamentals, especially corporate earnings. These CAPE-based rules will withdraw a little bit less than 4% when equities are expensive (i.e., today! ), but can also afford a slightly smoother ride through the various bear market scenarios considered here! It’s the natural extension of what we stressed in Part 17 of the series: The safe withdrawal rate has to respond to market conditions (in addition to idiosyncratic factors). But we can’t just set the initial SWR and then never touch it again. We should keep updating the subsequent withdrawal rates to reflect changing economic and financial conditions! A CAPE-based rule can do this and it’s intuitive, systematic and easy to implement! We hope you enjoyed today’s post! Please leave your comments and suggestions below and also check out the other parts of the series! Posted on August 30, 2017 March 22, 2019 by earlyretirementnow.comPosted in Asset Allocation, Safe Withdrawal RatesTagged bonds, CAPE, equities, finance, investing, personal finance, safe withdrawal rate, Shiller CAPE, simulations. Previous Previous post: How useful is international diversification? Wow, epic post, as usual! Can you please elaborate some more on why you wouldn’t set a=0 and b=1? That way you eliminate the volatility from the equity price index and shift completely to the much smoother CAPE/CAEY time series. Or am I missing something? No, you didn’t miss anything. This is a great question! I didn’t elaborate too much on the parameter choices for b (CAEY slope). The reason why you can’t set this parameter too close to 1 is that then you’d be back to the fixed withdrawal (pick one initial value and then CPI-adjust after that). You want to withdrawals to respond at least somewhat to an equity market drop. Not 1-for-1 (b=0), but somewhere in between, i.e., b=0.5 is a good starting point. By the way, the same is also true when equities are doing well. b<1 will ensure that you slowly increase your withdrawals to avoid accumulating too much capital over time. Great question! Thanks for stopping by! Mathematical question: is there CPI adjustments in the variable CAPE SWR methods? Or the fact that we are basing it on corporate earnings inherently adjusts for price changes? Non-mathematical question: saw you settled on a method, how would you propose to manage the subsequent years, especially since older folks experience diminished mental capacity? And at what point would you consider changing methods if withdrawals are not to your liking? 1: Everything I calculate here is done with real returns and real-CPI-adjusted withdrawals. Occasionally, the withdrawals may fall behind the CPI when there’s a drawdown in the stock market. But the rules are calibrated to make sure withdrawals roughly keep pace with inflation over the long-term. 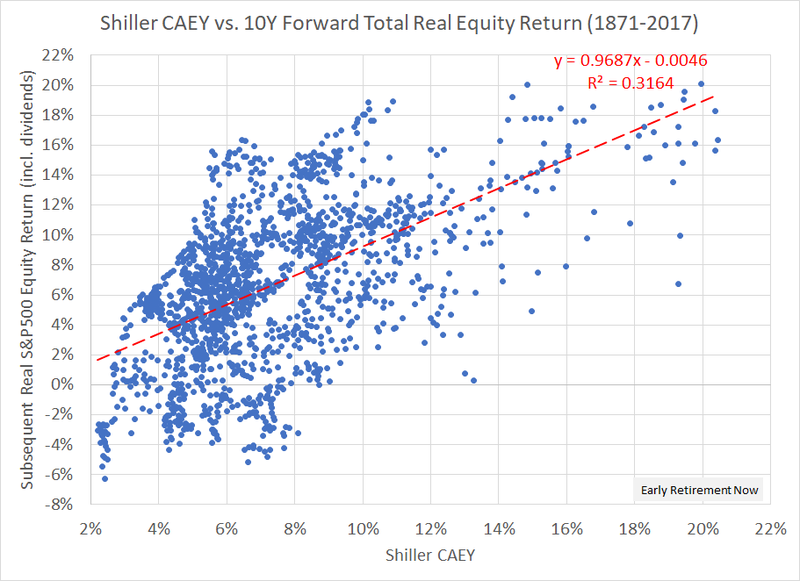 2: Reading off a Shiller CAPE number from his website should be easy enough for me accomplish for at least the next 30-40 years. Once I’m in my 80s I will hopefully have enough money left and my wife and I shouldn’t be worried anymore about running out of money. We can then set the rule to something simpler. As I hinted: if withdrawals fall behind for too long I am willing to think about capital partial depletion and adjust the withdrawal rule accordingly. All right, you’re on the right path… 😉 A few comments, one topic at a time. First off, earning yields (or 1/CAPE) is a real quantity, so is an SWR, so should be the % applied to the portfolio for withdrawals. So you really shouldn’t use the bonds yield (which is squarely a nominal quantity) when injecting bonds in the formula. Unless you use TIPS. Or if you adjust the bonds yield by the FED’s targeted inflation (~2% nowadays). I think you’re aware of that, but the current text of your post seems to muddle the issue. Also it would be great to include a statement about international — same idea, weighted formula based on AA, and either you succeed to find a CAPE number (Star Capital)m or back to a fixed number, e.g. the 5% historical return established by the DMS fellows. Adjusting the bond yield by a fixed number (2% throughout) is fine too, then the 2% would simply show up in the intercept (a). It’s the fluctuations of inflation, not the long-term average that make this difficult. In the end, I would probably just use the basic formula with c=d=0. Yes, I was suggesting 2% or TIPS Yield for CURRENT or FUTURE assessments. For backtesting, this is trickier. I personally subtract an average of the past 2 years, this is a poor model for expected inflation, but there is nothing better than I know of… For the future, I think we have a better handle, now that the Fed is getting much better at this than it was in the past. 2Y rolling inflation is still really noisy. Especially in the bad old days (pre-1920). But even more recently, past inflation was a bad indicator for true real-time expected inflation. I also tried some other rules, like exponentially weighted moving average, all to no avail. In the end, I settled on the (imperfect) measure of 3M T-bill yields. Second point. Yes, using an earning yield model is definitely a good idea, but it would be good to explain the WHY in addition to the WHAT. The seminal point is that the best semantics for the percentage used in a constant percentage formula is really to use an expected returns model (i.e. the center of a probabilistic distribution of expected outcomes). It only makes sense to spend what the portfolio is expected to return every year. Furthermore, if one uses a dynamic model (e.g. 1/CAPE, TIPS yield, etc), you adjust indeed to the roller coaster of human foolishness (big bears and big bulls), and bring some smoothness to the trajectory. Finally, IF the expected return model is robust enough (and 1/CAPE appears to be pretty good, both empirically and logically), this should (?!) self-adjust to an unpredictable future (there is no such thing as a Siegel constant – as proved by Int’l returns history). Now an A+B/CAPE formula seems a tad ad hoc, but can actually make (some) sense if one is wary about the reliability of earnings reporting, and wishes to mix historical returns (e.g. 5% to 6%) with a more dynamic prediction. And if one cannot stand the idea of a dynamic prediction, then back to a constant value (A), but note that this is NOT an SWR (which is a min value), this is an average expected return. Agree, this is a calculation CAEY -> expected returns -> SWR. Well… CAEY -> expected returns: YES. But expected returns -> SWR: NO. An expected return is at the center of a probabilistic distribution for the coming decade or so (as you just illustrated, thank you for that). An SWR is at the bottom of such distribution for an entire retirement period (e.g. 30 years or more). Way different (~2% on average!). Quite the opposite. E(ret) -> SWR. It’s true that the average 30-year return has little explanatory power for the SWR. But in the multivariate regression (6 windows, 5 years each). Very high and significant factor loadings on the first two windows, i.e., the portion predicted by the CAEY! Er… Ok… I’ll look at your detailed math when I have more time, and compare with my own… But this makes no sense whatsoever, sorry! 😉 Maybe we’re speaking past each other. Will check later. And I should add: To account for that “lower end of the distribution” we do that through the intercept! These are all good points. The dynamic version of the CPW is the CAPE rule I proposed here. G-K could be done with an initial SWR calibrated to expected returns. But if you keep changing the SWR in response to the changing CAPE then the guardrails are useless and we’re back my our CAPE rules. Of course one could find a compromise: set the initial GK SWR according to CAPE, then let the model work with the guardrails, but every so often (maybe every 5 years) we readjust the SWR to the CAPE expected returns. I still don’t like that method because it violates the “Principle of Optimality”, though. I definitely think about a future blog post: adjusting the VPW with depletion to take into account equity and bond valuations. LOL, you keep trying to inject an SWR in there… There is no SWR, it’s an expected return, an average (or an epicenter if you wish), not a historically safe minimum… G-K literature calls it IWR, but it’s a bit of a misnomer, it is the center point for the guardrails. And yes, you can indeed dynamically adjust it every year, and the guardrails keep doing their job, no problem. I modeled this idea at length (and same for the dynamic form of VPW) in a Bogleheads thread a while ago, and results were pretty good. Give it a try, you’ll be surprised… Or focus on a dynamic flavor of VPW if you prefer, I did settle on it after hesitating quite a lot. Either that or the dynamic CPW you modeled still overreact to price vagaries though, but real life isn’t perfectly constant either, and when combined with a fixed income stream (real or anticipated), this is probably good enough. After all, it doesn’t mandate your exact spend, it only provides a target, a guidance. Keep playing, it’s great that you’re giving more exposure to those ideas. which is why I think the predictor that I linked to is much better. It has the returns and the CAPE. Michael Kitces and you are on the same page as far as sequence of returns being the biggest risk to a retiree. The first 10 years of retirement being the most critical years for a 30 retirement window. To preserve your portfolio during those critical “red zone” years Kitces suggests it *might* be better to move more into bonds before returning to equities after the danger has passed. See the link below. What are your thoughts on this method? I agree with this qualitatively. But I would move up that equity share by a little bit due to the longer retirement horizon. “the more generous the SWR the more flexibility will be required if there’s a bear market!”. This captures very succintly why we are engineering in a much lower SWR than mainstream thinking – to avoid that “extreme bending” that may ultimately break you. And I did chortle when you highlighted the results from the dynamic rules implying a surprisingly high WR at 3.41%. Nothing like new data to challenge assumptions. Good science!! I didn’t quite realize how gung-ho MIchael Kitces was on SWR 4-4.5% and beyond. I listened to his podcast with the MF this week and although I enjoyed it very much, I didn’t hear much on the specifics of the current economic environment and what the 2017-2109 cohort should be thinking about regarding SoR risk and SWR planning. I listened to that podcast too. Michael Kitces still doesn’t distinguish the SWR with capital depletion over 30 years (4% seems OK) vs. capital depletion over 60 years (4% is a bit shaky) vs. capital preservation over 60 years (4% even shakier). He is also sloppy with the distinction of nominal vs. real returns. Kind of scary for a finance professional. It’s definitely a good idea for folks like us to be a little bit more cautious. 1- start out a little conservative by looking at CAPE at the time of the start of FIRE. 2- be flexible in spending when FIRE. How will this affect my FIRE? 1- As I am already 40 and plan to FIRE by 50-55, I look at a period of 45 years. As i do not know the market conditions at that time, I will plan with the 4pct rule for now. And I even imagine making some money in the first 5-10 years of FIRE, meaning that my actual withdrawal rate will be lower. 2- flexibility in the budget. As 25pct of our FIRE budget is travel budget, this should be doable. 3- any pension I might get from the government is not factored in. So, when the government would pay me 500€ per month or 6K per year, that will have a big impact on my number. I leave this out on purpose because I want to be independent. Haha, thanks! For FIRE at age 50-55 with a pension in your 60s you can probably go to 4% or even above! You seem to be in excellent shape! Thanks for sharing! Hi. I think you have at least 2 audiences, those who will have a long retirement horizon (60 years) and those who will have a more traditional retirement horizon (35-40 years) (and probably everyone in between). I always appreciate when you distinguish which audience the #s and your comments are referring to. I would ask that you specifically and consistently address both audiences in your blogs, so we all can benefit from your calculations and conclusions. That may double your efforts, if so, apologies! Thanks. Good point! The CAPE-based rules are applicable to both the traditional and early retiree. Well, the traditional retiree who wants to preserve the capital. WIth capital depletion, over 30 years one could make an allowance and increase the SWR along the way. Thanks for stopping by! Just replying again as I want to be notified of new comments and don’t think I clicked on that the last time. Thanks. What a great series. Thanks so much for your work. On the ChooseFI podcast you mentioned increasing your bond allocation for the first decade after retirement as another way of reducing the sequence of returns risk. Most of your simulations are done with 80/20 split. Have you you simulated the impact of 60/40 or 50/50 for that initial decade in addition to using adjustments based on CAPE? That’s in the works! To be published Sep 13 or 20!!! The countries that negated the 4% and allowed a much lower SWR were those that were invaded and/or destroyed in WW2 (and/or WW1). As much as I support lowering the SWR to below 4%, I don’t think we have to resort to calculating the SWR of Austria/Germany/Japan/Italy during WW2. The U.S. will never share that fate! My main criticism with the 4% is still the same as before: It may wipe out the portfolio after 30 years (still a success for a 65-year-old, not so much for a 30-year-old retiree and it’s averaging over retirement start dates that are very much unlike we face today (high CAPE, low bond yields). Are you saying you did a hack and Bill Bengen is a hack? Just kidding. Yes, I agree with you. I believe your calculations and my own simulations much more. The fail-safe SWR is much lower than the 4.5% rate that Bengen now proposes. I don’t know how he arrived at the number but my suspicion is that he optimized, backward-looking (! ), the asset allocation to generate the maximum fail-safe SWR. Which is a pretty ludicrous exercise because back then nobody knew that all you had to do is to invest in small-cap value. Hey ERN, don’t put words in my mouth! I have a lot of respect for Mr. Bengen. Just that in this particular case, I found his SWR conclusion risky for long retirement horizons. I intend to stick with my Independant research finding as I described in the article link above. Am I doing this correctly? Today, using the CAPE Robust, the SWR is only 1.96% (using a&b) or 1.97% (including all a-d)? Does this make you think your “normal” 3.25% SWR is too high? Thank you for your efforts and publishing! The most recent 10Y rate is a little bit lower, now just a little bit below 2%. So that should take down the WR by another roughly 0.03%. A theoretical math question: a linear regression is performed to arrive at said coefficients (a-d). However,since the CAPE is in uncharted territory, doesn’t that mean we are extrapolating which can have highly unpredictable results. First, I never ran any linear regressions to come up with the results here. I picked parameters for the CAPE rule and looked how the past performance would have looked like for different retirement cohorts. In general, though, when you run a regression, you can use it to forecast and the forecast error is indeed a function of the degree of “uncharted territory” you are moving into (i.e., how close are the x-values for which you want to forecast to the x-values that were used to estimate the parameters). But again, nothing here is the result of a regression analysis. The consensus was that bonds are not really worth it in accumulation phase. In retirement phase might serve as a bond tent as BigERN has described earlier. Timing the market is always bad, here it’s just used to adapt the SWR. – Can you please help me understand how you calculated the `SWR as of August 2017`? It would be great if you can share the formula or spreadsheet for that. – I was also wondering if there’s an international equivalent of the CAPE, since CAPE seems to be based on the SP500 companies (so Total Stock Market/VTI vs Total International Stock Market/VXUS)? Thanks! If the CAPE is 30, you’d calculate 1%+0.5*(1/30)=2.67. The intercept and slope parameters is all you need for the calculation. So why is a=0.5? Is this just randomly picked or is there any explanation for that? 2.67 seems really low, even with current high valuations. I was calculating with something like 3.25-3.5%…. b=0.5 (not a, a is the intercept) is actually a well-chosen number. b=0.0 (and, say, a=4%) brings you back to the constant % rule. Very volatile withdrawals because you respond 1-for-1 to portfolio changes. b=1.00 brings you back to roughly a fixed withdrawal amount (like the traditional 4% rule). In other words, the portfolio goes down by x%, you increase the withdrawal-% to roughly keep the amount the same. Not recommended because you may run out of money. Going half-way in between those extreme cases seems to be something of a sweet spot. React to portfolio variations: React enough to not run out of money but not so much that your withdrawals become too unpredictable! The backtesting is pretty simple. You just to one single run for the entire history. X(t)=[X(t-1)-W(t)]x(1+R(t)) and W(t)=w(t)*X(t-1) and w(t)=a+b/CAPE. I would probably use a lower intercept when using 60/40. Hi guys quick question. Any chance of getting a spreadsheet that uses a more global portfolio eg global stock market, global gov bonds? The reason is because I live outside the US and when I ran portfolios with a US focussed and a global portfolio, I did see a significant difference in success rates in portfolio visualiser. Thus the SWRs, even if using CAPE based rules, could have different results. Any help would be really appreciated. Thanks. It’s on my to do list. I have international stock returns. But only since 1970. Not sure about international bind returns. That would be awesome! Credit Suisse have annual reports on stocks and bonds on a global level. Also, portfolio visualiser have some data on that too. Hope that helps. See what else I can find. Hi Karsten, this is my second read through of the whole series and I must say, your work is the single most important contributor to the FI community’s knowledge on WR. I understand the formula and from your comments, b = 0.5 appears to be a sweet spot but how does one choose the value for “a”? Please see the Google Sheet in SWR Part 7. I added a tab where you can play around with the CAPE rule parameters and see how withdrawals would evolve over time.